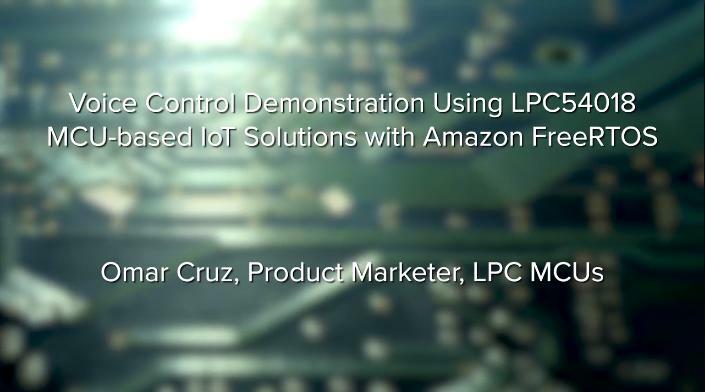 Offering flashless design and security integration, the LPC540xx family of MCUs combines a 180 MHz Arm® Cortex®-M4 core with a power-efficient and unique architecture, advanced HMI and flexible communication peripherals for real-time performance in the next-generation IoT. Featuring flexibility with a quad SPI flash interface, CAN, graphic LCD and up to 11 channels for FlexComm, the LPC540xx family provides the ability to adapt as requirements change. Compatibility within the LPC54000 series enables the LPC540xx MCU family to provide a seamless migration path for increasing processing power and adding the flexibility of additionally advanced peripherals. For added security, the new LPC54S0xx MCU devices in this family provide Physical Unclonable Function (PUF) root key using dedicated SRAM for silicon fingerprint making it possible to generate, store, and reconstruct keys. 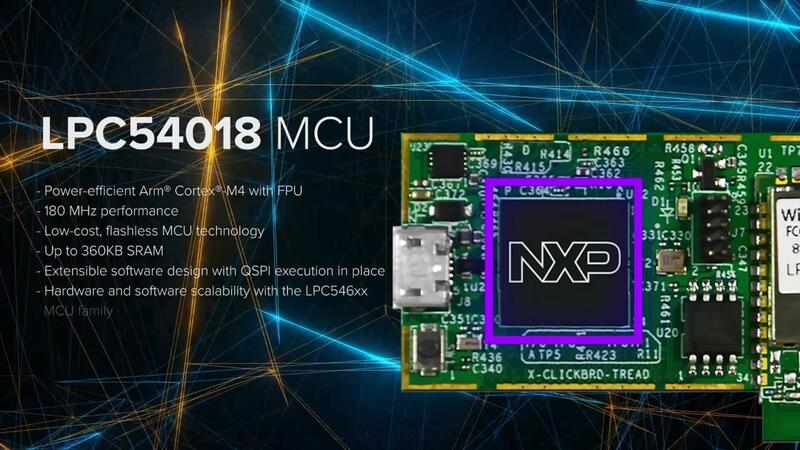 In addition, the LPC54S0xx devices feature an on-chip hardware AES engine to protect the image content and accelerate processing for data integrity and proof of origin. Data can be encrypted or decrypted by the AES engine using the encrypted key stored in the OTP, SRAM PUF-based or a software supplied key. Arm Cortex-M4 processor, running at a frequency of up to 180 MHz. 360 KB total SRAM consisting of 160 KB contiguous main SRAM and an additional 192 KB SRAM on the I&D buses. 8 KB of SRAM bank intended for USB traffic. General-purpose One-Time Programmable (OTP) memory for *AES keys and user application specific data. In-Application Programming (IAP) and In-System Programming (ISP). ROM-based USB drivers (HID, CDC, MSC, and DFU). Booting from USART, SPI, I2C, USB0/1, EMC (static memory), and SPIFI (QSPI flash). Secure boot using AES128 in GCM mode to authenticate and decrypt firmware (Encrypted image boot). Flexcomm Interface contains up to 11 serial peripherals. Each Flexcomm Interface (except flexcomm 10, which is dedicated for SPI) can be selected by software to be a USART, SPI, or I2C interface. Two Flexcomm Interfaces also include an I2S interface. Each Flexcomm Interface includes a FIFO that supports USART, SPI, and I2S if supported by that Flexcomm Interface. A variety of clocking options are available to each Flexcomm Interface and include a shared fractional baud-rate generator. DMA controller with 32 channels and up to 24 programmable triggers, able to access all memories and DMA-capable peripherals. LCD Controller supporting both Super-Twisted Nematic (STN) and Thin-Film Transistor (TFT) displays. It has a dedicated DMA controller, selectable display resolution (up to 1024 x 768 pixels), and support up to 24-bit true-color mode. External Memory Controller (EMC) provides support for asynchronous static memory devices such as RAM, ROM and flash, in addition to dynamic memories such as single data rate SDRAM with an SDRAM clock of up to 100 MHz. EMC bus width (bit) on LQFP100 and TFBGA100 packages support up to 8/16 data line wide static memory. Ultra-low power Micro-tick Timer, running from the Watchdog oscillator that can be used to wake up the device from low power modes. Brown-Out-Detect (BOD) with separate thresholds for interrupt and forced reset. Available in TFBGA180, TFBGA100, LQFP208, and LQFP100 packages.